How do I Choose the Best Folic Acid Pills? A person taking a folic acid pill. Folic acid, sometimes referred to as folate, is a B-vitamin found in prenatal and multi-vitamin supplements as well as in folic acid pills. Other sources of folic acid are foods such as liver, legumes, fruits, and green leafy vegetables. Folic acid is important for the overall quality of health and is said to aid in preventing or improving a number of specific ailments. Supplements containing folic acid can help ensure that you are getting the recommended daily requirements. The Recommended Daily Allowance is 400 micrograms per day. While this amount can be obtained through foods, many people don’t get enough through their diets alone and therefore choose to use folic acid pills in addition to their dietary intake. When choosing folic acid pills, dosage is clearly an important factor. While few in the medical field worry about folic acid intake reaching toxic levels, remember that even vitamins and supplements can end up being too much of a good thing. If you eat quite a bit of food containing folic acid, you may need lower dose folic acid pills to obtain the rest of the daily allotment. Sometimes, higher dose folic acid pills may be recommended, for specific indications. There are studies available that link folic acid deficiency to myriad health issues. Studies have been done to show that various dosages may help improve a number of conditions from staving off Alzheimer’s disease and reducing the effects of depression and other mental disorders, to lowering the risk of heart disease and raising sperm count. If you are using folic acid pills for a specific health concern, you will want to choose tablets that provide the dosage recommended or a lesser amount that you can double up on rather than choosing one that exceeds that amount. Check with your doctor or pharmacist to find the appropriate dosage and to check for drug interactions. There are also pills that contain other supplements such as additional B vitamins, vitamin C and more. Pre-natal vitamins are designed to contain a number of necessary supplements to help ensure maternal and fetal health but there are other combinations as well. Additional supplements may also be a deciding factor in choosing which folic acid pills are best for you. Not only may it be more cost-effective to choose a pill that contains other supplements, but you may be able to take only one pill instead of several. 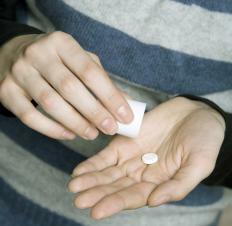 Many people do not enjoy taking pills, so the fewer the better. It is also a good idea to look for easy-swallow pills. What Is the Acid Number? What Are the Best Tips for Swallowing Pills? What do Folate Levels Indicate? What are the Effects of Folic Acid on Hair? I like folic acid capsules vs folic acid powder or tablets. The tablets smell and taste funny and make me nauseated. @alisha-- Yes, the recommended dose for pregnant women (and those planning to conceive) is also 400 micrograms. The bottle should say 400 ug on the label. "Ug" stands for micrograms. Don't confuse folic acid 400 ug with folic acid 400 mg. The latter will cause an overdose of folic acid. I'm pregnant and only taking folic acid 400 ug right now because I had a blood test done recently and I don't have any vitamin deficiencies. If you're pregnant and planning on taking folic acid, talk to your doctor first. It's a good idea to check your current levels of folic acid because some women are deficient in folic acid and need more than 400 ug. Some mothers also become deficient in iron and zinc during pregnancy and may need to take a multi-vitamin instead. So it completely depends on your individual needs. Is the recommended daily dose of folic acid for pregnant women also 400 micrograms? What about for women who are not pregnant but planning to conceive? Is it better to take only folic acid supplements during pregnancy or supplements that contain other vitamins in addition to folic acid? Is anyone here pregnant? What type of folic acid supplement are you taking?